The Bilingual HOA Holds the Composition of the Literary Section of HOA! Rise with Bilingual HOA Immediately! When you rise with "Bilingual HOA" bilingually with the poetry it has on beautiful images, you will find it easier to water your literary fountain ... just like the poetry you read on these beautiful pictures. hoa-politicalscene.com/arabic-hoa.html - Bilingual HOA: Snippet of poetry from "Exodus" by poet and journalist Khalid Mohammed Osman on Beyonce, as one of the Dream Girls. Watering this fountain takes the shape of shaping styles of writing and using a specific frame of words found nowhere else to appear in expressions simultaneously as the same found nowhere else and belong to nobody, but you. 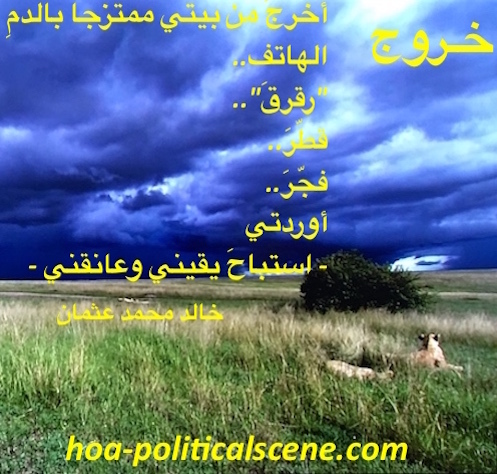 hoa-politicalscene.com/arabic-hoa.html - Bilingual HOA: Snippet of poetry from "Exodus" by poet and journalist Khalid Mohammed Osman on Masai Mara National Reserve. And thus, you arrive at the definitive tempo of a specific passion you make as your passion and give it your life to succeed on it. 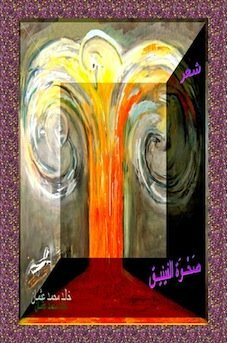 Although this is the page to get the glimpse and enjoy the inspiration in the HOAs Arabic poetry, but the complete guidelines to build the passion are on an article titled passion on another website here. 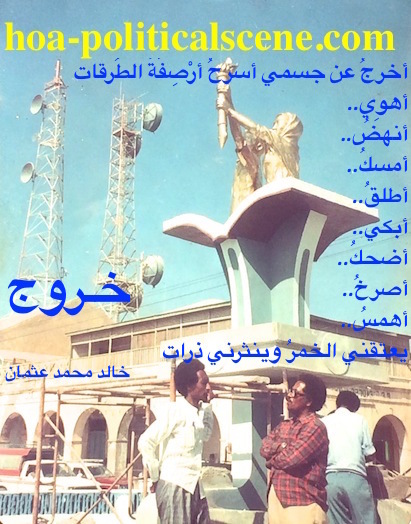 hoa-politicalscene.com/arabic-hoa.html - Bilingual HOA: Poetry snippet from "Exodus" by poet Khalid Mohammed Osman on street monument in Port Sudan done by sculptor Abulhassan Medani. This page started at the Comment C2 Entries and this one started at HOA Index and the last one started at HOAs Arabic Literature. But, anyway, they are connected with the other literary projects and products on the Horn Africa's Network. 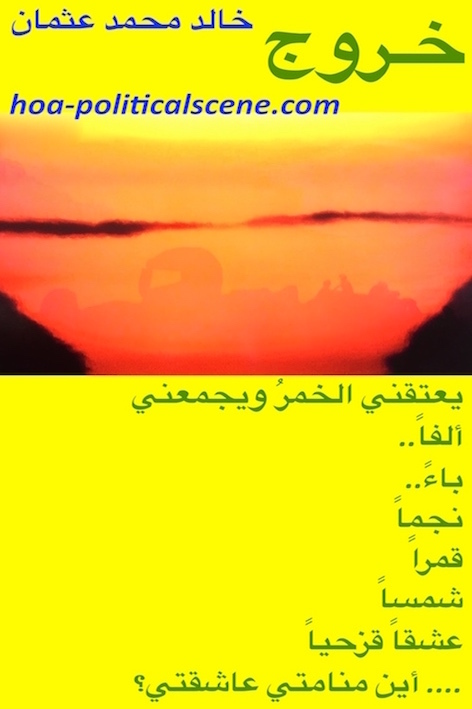 hoa-politicalscene.com/arabic-hoa.html - Bilingual HOA: Poetry couplet from "Exodus" by poet Khalid Mohammed Osman on beautiful design. The projects are divided into cultural projects and humanitarian and political projects. 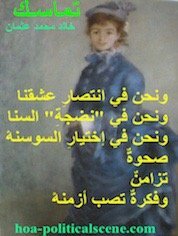 Each of the projects, whether cultural, humanitarian, or political are also divided in course of language structure into two languages: Arabic and English. 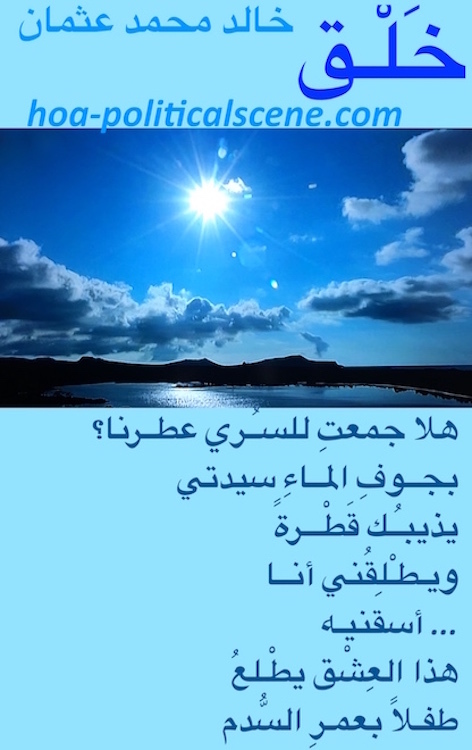 hoa-politicalscene.com/arabic-hoa.html - HOA Bilingually: Couplet of poetry from "Creation" by poet Khalid Mohammed Osman on beautiful sea, sky and clouds. This is as so important as to organize the HOAs Comprehensive Projects in structural manner and make the time you spend on those projects a pleasure and encourage you to be part of this network. 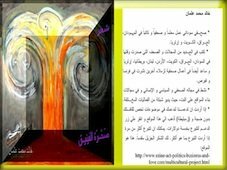 hoa-politicalscene.com/arabic-hoa.html - Bilingual HOA: Scripture of poetry from "Creation" by poet and journalist Khalid Mohammed Osman imaged on a picture worth a thousand words. This is important as far as you think of achieving good infrastructural development in terms of human understanding and activities to make their places the best places in the world. hoa-politicalscene.com/arabic-hoa.html - Bilingual HOA: Poetry scripture from "I Call You Samba, I Call You a Field" by poet and journalist Khalid Mohammed Osman imaged on a field. secondly to believe that there should be infrastructural changes in the way everybody thinks and deals with things and occurrences. 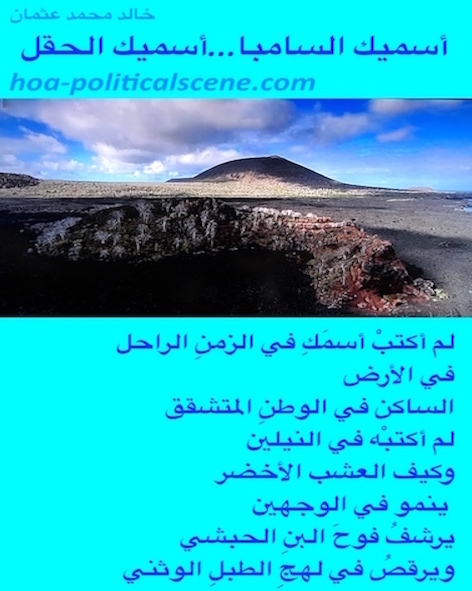 hoa-politicalscene.com/arabic-hoa.html - Bilingual HOA: Poem from "I Call You Samba, I Call You a Field" by poet and journalist Khalid Mohammed Osman on green fruitful land. 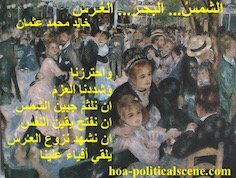 hoa-politicalscene.com/arabic-hoa.html - Bilingual HOA: Poem from "New Adam" by poet and journalist Khalid Mohammed Osman on beautiful Siamese, Thai girl dancer. hoa-politicalscene.com/arabic-hoa.html - Bilingual HOA: Poem scripture from "New Adam" by poet & journalist Khalid Mohammed Osman on the love of Loren Tate and Eddie Duran in Hollywood Heights. hoa-politicalscene.com/arabic-hoa.html - Bilingual HOA: Poem scripture from "New Adam" by poet & journalist Khalid Mohammed Osman on Brittany Underwood, as Loren Tate on Hollywood Heights. 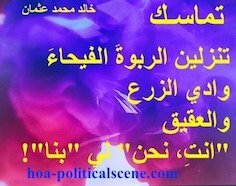 Although the entire HOA Political Scene with the HOA Political Scene Blog and the Arabic HOA Political Scene is a product and specifically an electronic product, it however, include small production units with many products. hoa-politicalscene.com/arabic-hoa.html - Bilingual HOA: Poetry scripture from "Rising of the Phoenix" by poet & journalist Khalid Mohammed Osman on western Sudan women's music / drums. 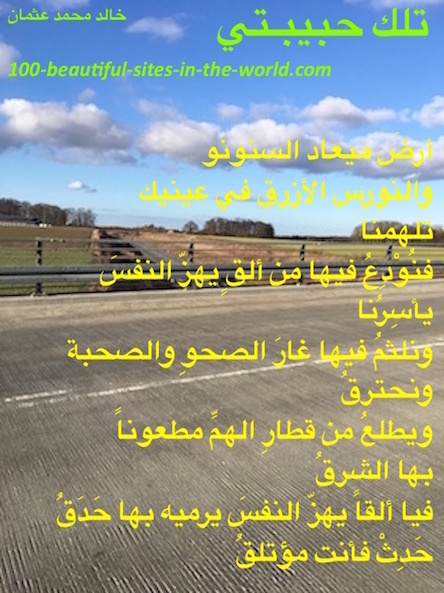 The Bilingual HOA's Products in Arabic! 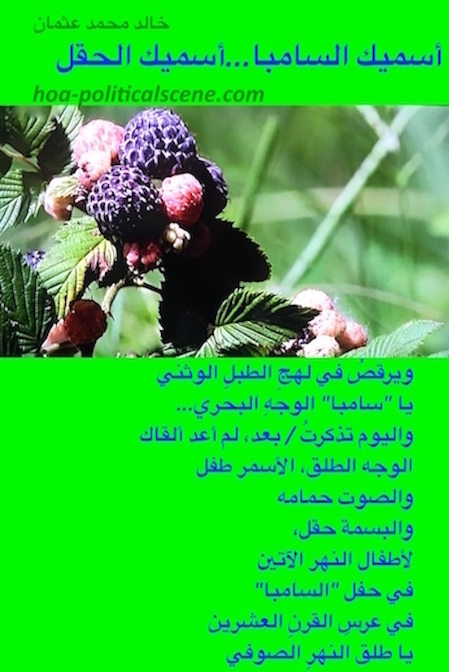 hoa-politicalscene.com/arabic-hoa.html - Bilingual HOA: Poetry snippet from "That's My Love" by poet & journalist Khalid Mohammed Osman on irrigational fertile homeland in central Sudan. The Bilingual HOA's Products in English! Share the web address of the Bilingual HOA as hoa-politicalscene.com/bilingual-hoa.html with your social media, or pin the pictures, or subscribe to the updates, or subscribe to the newsletter (see the form at the top left column), or use the comments form below to comment. You can use the same form to write any literary work you have. Thanks.